I’m sitting in a coffee shop on an ordinary morning and my courage feels as drained as my latte, nothing but a bit of foam left at the bottom of my cup, nothing but a little hope left at the bottom of my heart. We all get to this place as humans. It is part of living in this world. God knows this because He lived here too. He understands what it means to skin our knees, lose our grip on dreams, and want to hide under the covers. I used to think success meant never growing weary. But I have come to understand it means not giving up. It doesn’t mean feeling strong all the time; it’s seeking God in our weakness. It’s not looking as though we have it all together; it’s knowing God alone holds us together. Success doesn’t mean finishing first—it means taking one more step of obedience. Battling discouragement doesn’t mean we’re failing—it means we’re fighting. Even when we can’t feel it, see it, or even imagine it, our victory is still sure. Not because of us or anything we do, but because of the undefeatable God who lives within us. P.S. This post is an excerpt from my new gift book Promises from God for Life’s Hard Moments. Get it exclusively from Altar’d State in July and everywhere books are sold in August. There’s a journal too! Holley, you are such a talented and insightful writer. I love your posts. The part about success meaning never giving up, rather than never growing weary and the verse from Joshua are especially inspiring. Thanks for sharing an excerpt and congratulations on your new book! God bless you for this one. Thank you. Holley… AGAIN you’ve nailed it. You’re such a gifted writer because it all comes from the heart<3 Praying God uses this book, that it will gift hope to the hurting. Holley, I too have found success has more to do with faithfulness than results I can measure. I like your phrase, “It’s not looking as though we have it all together; it’s knowing God alone holds us together.” Congratulations on your new book! 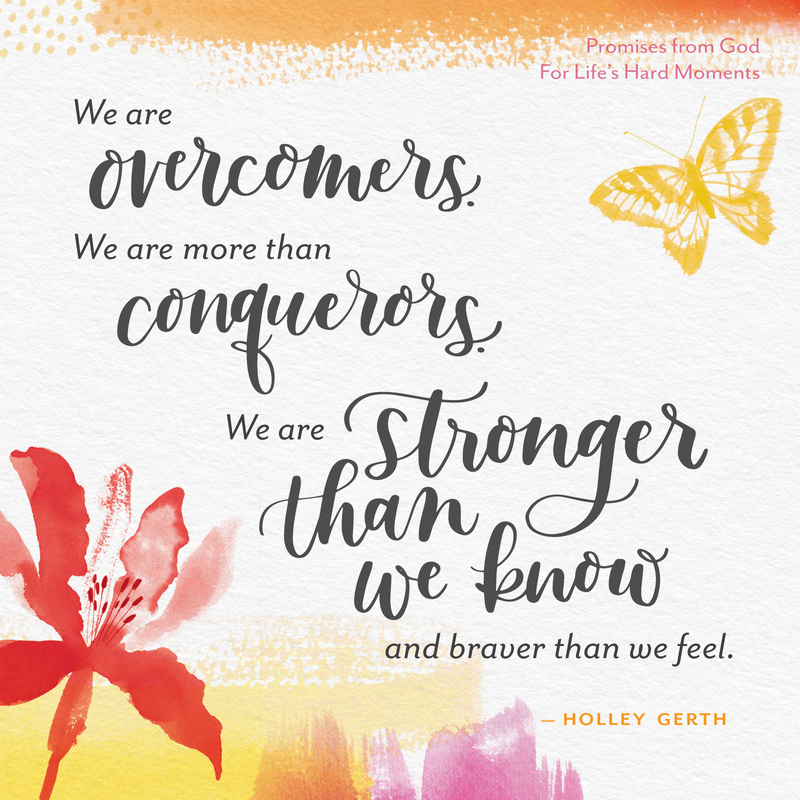 Holley, I loved this quote: “Battling discouragement doesn’t mean we’re failing—it means we’re fighting. Even when we can’t feel it, see it, or even imagine it, our victory is still sure.” That’s a powerful thought! And I needed to hear it. Thank you so much for your writing and ministry here. It makes a difference! Blessings! 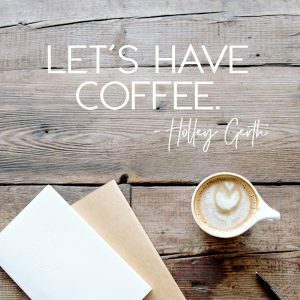 Thank you for this post, Holley! Discouragement is no stranger to me. I am learning to refocus on God rather than on the object of my discouragement. Recently I was reminded to look to what He has already done for me and know that He can carry me through this moment just as He did before. Thank you for the perspective that battling discouragement doesn’t meant we’re losing but fighting! THANK YOU SISTER. I NEEDED THIS TODAY!!! Thank you, Holley! Perfect words for me today. Thank you for your words today – I read every post you send and it is amazing how many times, your words are exactly what I need to hear. I’m in a transition phase and truly struggling with the situation – I’ve been asked to retire in December so the company can hire two people with more accounting experience than I have – with more technical expertise than myself since I am at an age when setting the settings on my phone somedays is a difficult challenge. Also I’m old enough to be everyone’s grandmother here so it is time for me to mosey on down the road. Problem is, I love working and being out with people, but my husband has had a stroke a few years ago and continues to go downhill so he really needs me. I want to help him as much as I can so he can enjoy his life as long as possible, but I will miss being with my friends each day. Bittersweet situation and I’m dealing with it thanks to God’s guidance and strength. I know he will be with me and lead me where I need to be – and I know he has said “don’t be anxious” – so I constantly tell myself “don’t be anxious – God says “Don’t be anxious” – — Again, thank you for your words – you are wise and God-inspired!!! Change is never easy. We enjoy the routine of daily life. God knows your needs & those of your husbands. He is making a way for you to be there for him. Treasure this time with your husband. Enjoy the little things in life. Go for walks or just sit together on the porch or couch. Take life one day at a time with God as your guide. I know you will miss being with people. God will show you ways you can get involved with or be around people. You will have more time to do some local ministry work. There are lot of options. Know that God will provide for you each & every step of the way. A few years ago I quit a full-time job to be more available for my aging dad. It was the best decision I made. God guided my steps & gave me wisdom & calmness to deal with his physical & dementia ailments. it was during that time I got more involved in my church & local missions. You never know what God has in store for you. Thank you, Holley. It’s always uplifting to read and enjoy your messages. Thank you Holley. Timing is everything and this is right on time. Absolutely, success is not giving up. We will grow weary but God will dill us ip again. Love.. .love your postings. You are so gifted with your inspirational words. I thank Jesus for your wonderful sharings! I love your quote from Joshua and your line.. its knowing that it is God alone who holds us together. I had severe agoraphobia for twenty years and knew that ti was God alone who held me together…and good friends who prayed for me, which helped me care for my precious children. This world defines success as being popular, wealthy & having a great job. God doesn’t see it that way. His version of success is for us to commit our plans to Him & he will establish them. He wants us to put on the full armor of God & fully trust Him with everything we do. We don’t have to be strong just courageous and obedient to the Holy Spirit’s leading. Taking baby steps daily to follow God wholeheartedly. Success in God’s world means never ever giving up or in to the devil’s lies! One of my go to Bible verses! Thank you Holly!! I am going through some health issues, and being misunderstood by some family members at the present time. I am school teacher, and I am believing I will be strong and ready when the new school year begins. “Battling discouragement doesn’t mean we’re failing—it means we’re fighting.” This encourages me because too often I get hard on myself when I’m discouraged, which makes it even worse. I loved the encouraging words!!! Love the verse from Joshua!!! To never give up or in!!! God’s plan is perfect I am not but he already knows that!!! We are loved just the way we are!! !